Nothing makes me love my state more than seeing it in all its literary glory. The Minnesota Book Awards is a wonderful showcase of the best this state has to offer in terms of words. Reading series and literary talks, such as those at the Hennepin County Library, attract major crowds. 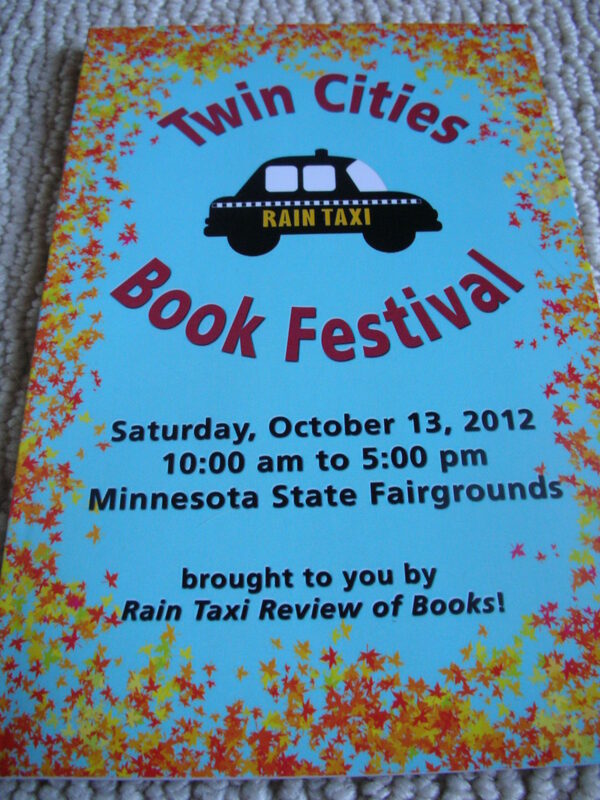 The Twin Cities Book Festival is another fantastic literary event, and I attended on Saturday, Oct. 13. Attending the panel discussion on author publicity. I’ve attended similar panels in the past at different events, but this was the first one I attended where I could listen to the advice as an “author.” My book is coming out in March and I look forward to putting into action some of the advice I heard from Jocelyn Hale, The Loft executive director, Lorna Landvik, author extraordinaire (more on her later), Jerrold Jenkins, who owns a publishing services firm, and Steph Curtis, a producer at Minnesota Public Radio. Feeling good about the state of publishing. I loved seeing so many authors peddling their non-mainstream books. It reminded me of what Jocelyn Hale said at the panel: “What’s your goal?” Not everyone’s goal is to sell books in the Stephen King or J.K. Rowling range. Simply getting a book published is a fantastic goal, and if you can get it in the hands of readers, even better. The authors on Saturday were working hard on the latter. 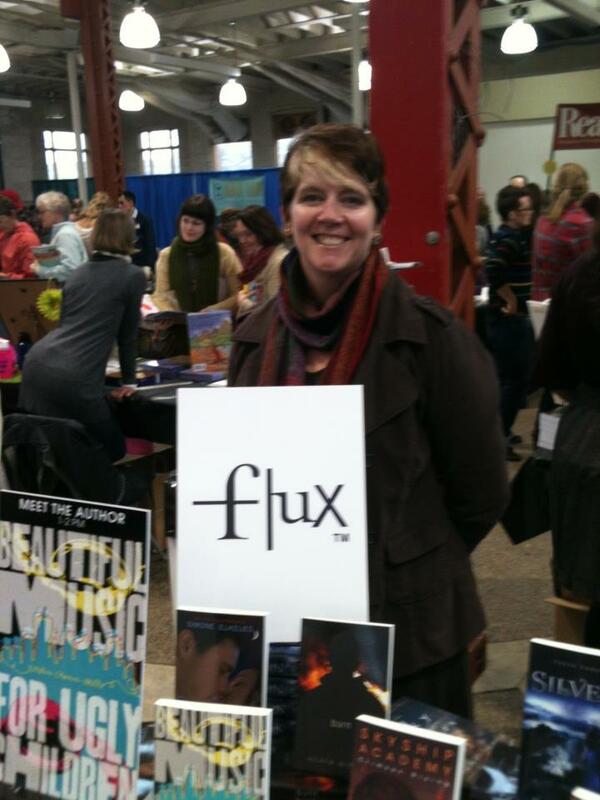 Kirstin Cronn-Mills at the Flux table with her book, Beautiful Music for Ugly Children. Photo by Rachael Hanel. Seeing my friends signing their books. Nick Healy (It Takes You Over), Kirstin Cronn-Mills (Beautiful Music for Ugly Children) and Allen Learst (Dancing at the Gold Monkey) spent some time at their respective publishers’ tables. I hadn’t seen Al for a few years so it was nice to connect. Meeting Facebook friends I had not met in person. Yes, I’m a person who will friend people on Facebook I’ve never met if we have several mutual friends. I finally got to speak to Esther Porter, Blake Hoena, and Kate Kysar. I connected with my friend Lisa MB Simons, whom thankfully I met in person before I friended her on Facebook 🙂 Same with my good friend Jim Rogers. Chatting with Lorna Landvik. I tend to “geek out” at these types of events and have been known to gush accolades at my favorite authors. (Look for a future post about such a moment with Alison Bechdel). Lorna has a fabulous story in that she is so well-known for humorous fiction but when she wanted to write a book that features aliens, her publisher said, “Ummm, no.” It didn’t fit the Lorna Landvik “brand.” But she’s like, I’m Lorna Landvik. I’m writing this book. Therefore, it is a Lorna Landvik book! She decided to self-publish Mayor of the Universe and is pounding the pavement to do her own publicity. She currently doesn’t have a book deal for any future books. I like to think when she’s ready to write more books, someone will pick her up in an instant. I thought it was funny that you can buy Pronto Pups at the state fairgrounds (where the book festival was held) even when it’s not State Fair time. Too bad there wasn’t a Sweet Martha’s cookies booth. Some of the info I picked up on Saturday. Submit, submit, submit! I plan to. 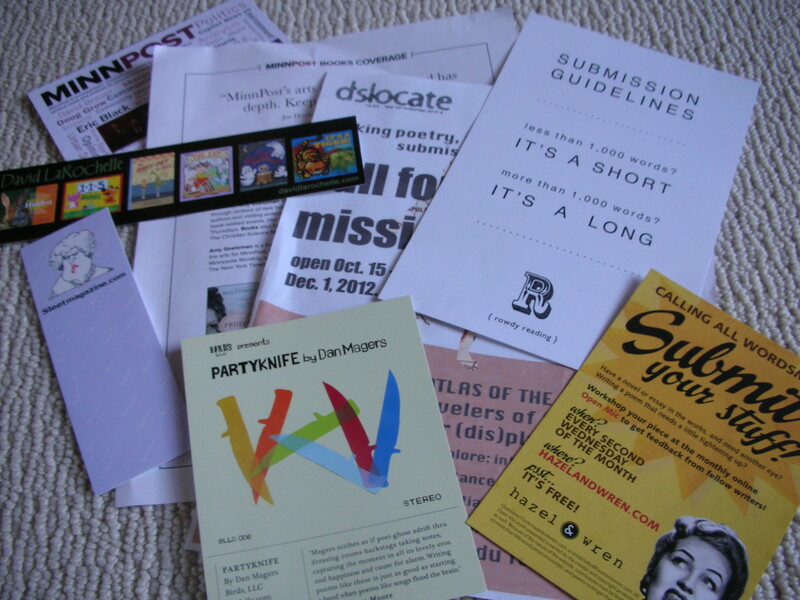 Do you regularly attend writing/book festivals? What are your favorite moments when doing so? I love the idea of book festivals–and I always tell other people to go. Go! But I never go to them anymore. They’re too overwhelming for me, and send me into sensory & information overload. This used to make me feel like I was missing something (and, of course, I am), but now I realize I use trusted friends and acquaintances as reconnaissance. They come back and tell me who was there and what impressed them. Which is why the success of a book fair cannot be judged entirely on the attendance and sales of the moment–there’s always a ripple of energy that goes out from them. Tracy, I definitely experienced sensory overload! I was exhausted going into the festival, and only became more so as the day went on. I was there for about four hours. It’s wonderful to get people to report back! I will try to put up a post this week that summarizes the publicity panel I attended. Thanks for the bit about connecting with me! Loved seeing you! I loved seeing you, too! It was great to spend a little time catching up! Golly Rachael….I’m the Mom who would sell her sweets at a book event! There might be an opportunity! There was only one food booth at the festival. I was getting pretty hungry!